The Dartmaster is a wooden jerk lure designed for spinning anglers who desire to actively influence the movement of the lure. 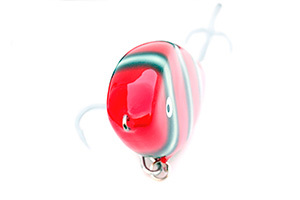 The lure glides from side to side, flashing its coloursful flanks. Spending time fishing with the Dartmaster will be enjoyable and refreshing for anglers. The ideal place to use Dartmaster is in water under 2,5 meters. At the edge of the reeds or near by steep sided shorelines, ledges, rocks, in small bays where the big fish feed, are excellent places to fish with DartMaster.